Bell’s palsy is a condition that can be quite alarming at the onset. Immediate complete facial paralysis is the first sign, and it comes on suddenly. With symptoms often mimicking those of a stroke, patients need to seek medical attention right away to rule out other more serious conditions. When all other possible causes have been ruled out (such as stroke and tumor), then a Bell’s palsy diagnosis is made. 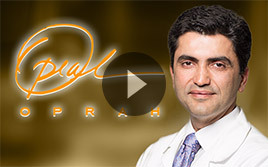 Babak Azizzadeh, MD, FACS, is the director of the Facial Paralysis Institute and provides Bell’s palsy treatment. If you ever experience sudden onset facial paralysis, it is imperative that you go to the emergency room immediately. When you arrive, the doctors will run a multitude of tests to determine the cause. If it is determined to be Bell’s palsy, the most common course of action is to take a high dose of steroid and anti-viral medication, as Bell’s palsy is thought to be caused by the sudden activation of a virus that affects the facial nerve. Treating the condition immediately can help prevent it from progressing and causing long-term damage to the facial nerve. The facial paralysis brought on by Bell’s palsy is usually temporary, but there is no way to determine just how long it will last. For those patients with lingering partial facial paralysis, Botox treatments can help restore symmetry to the face. Botox is a temporary injectable treatment that has been shown to work very well in Bell’s palsy patients. Botox is a neuromodulator medication that alters the neural impulses to the muscle in which it is injected. For Bell’s palsy treatment, Dr. Azizzadeh will inject the Botox into specific hyperactive muscles in the paralyzed side of the face, causing them to relax and hence improving tension and the smile mechanism. The result is a more symmetrical facial appearance. Although Botox is a temporary solution, the treatment can be repeated if it wears off before the Bell’s palsy facial paralysis has subsided. Dr. Azizzadeh is one of the best facial paralysis surgeons in the world, and he is known for his innovative surgical management of various degrees of facial paralysis. For patients who suffer permanent facial paralysis as a result of Bell’s palsy, there may be a surgical option for improving symptoms. When you visit Dr. Azizzadeh for the treatment of permanent facial paralysis, he will perform a number of imaging tests along with a thorough examination to determine if you are a candidate for surgery. 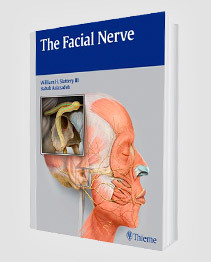 Some patients may benefit from facial nerve decompression surgery, in which the doctor releases some of the pressure that may be affecting the nerve and worsening symptoms. 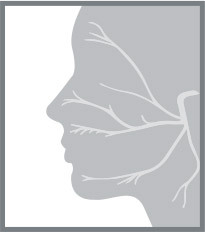 Selective neurolysis and platysmaplasty in combination with static suspension and facelift could potentially help improve the spontaneous smile mechanism. Another common issue with permanent facial paralysis is incomplete eyelid closure. Many facial paralysis patients cannot fully close their eyes, which leaves the eyes exposed and at greater risk for injury. The eyes will also become painfully dry if they cannot close all the way, so it is important to seek treatment. Dr. Azizzadeh works with an expert team of oculoplastic surgeons to help patients suffering from incomplete eyelid closure caused by Bell’s palsy facial paralysis. 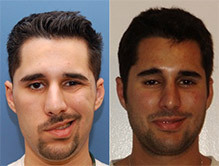 Call Today for the Best Bell’s Palsy Treatment! If you are suffering from Bell’s palsy facial paralysis, or living with permanent facial paralysis caused by Bell’s palsy, know that there are treatment options that could greatly improve quality of life. Dr. Azizzadeh and his team at the Facial Paralysis Institute provide the best Bell’s Palsy treatment in the country and would love to help you today! Call (310) 657-2203 to schedule a consultation! To learn more about the best Bell’s palsy treatment, contact our office.